"Before we heard Mark we had no intentions to ever get ACCEPT back together again. We didn’t know a guy like Mark existed." Guitarist Wolf Hoffmann is no stranger to KNAC.COM readers. 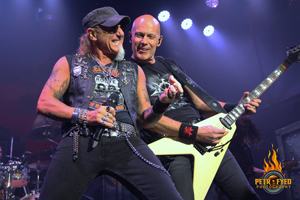 ACCEPT are a pioneering heavy metal act that have recorded classic albums such as Breaker, Metal Heart and Balls To The Wall and countless iconic metal anthems—they are a staple in a metal aficionado’s listening repertoire. If you’ve followed ACCEPT you’re fully aware that the band went their separate ways with [singer] Udo Dirkschneider years ago and enlisted the services of Mark Tornillo [T.T. QUICK]. 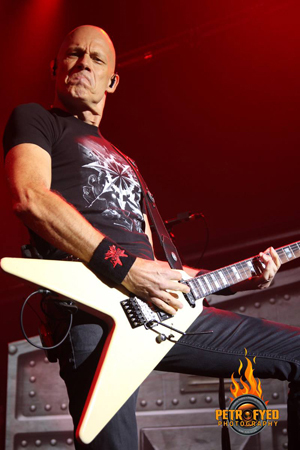 ACCEPT has issued a lot of new music since that time, like Blood Of The Nations , Stalingrad , Blind Rage  and The Rise Of Chaos  to rave reviews. If you ask the fans, there’s no question that ACCEPT has been rejuvenated. KNAC.COM caught up with Wolf before the band went on a mini tour of the United States. 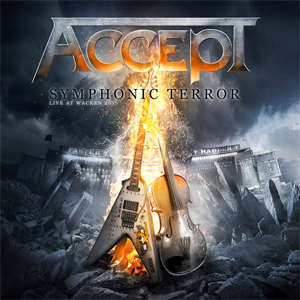 Wolf was doing press for ACCEPT’s upcoming live Blu-Ray and CD set Symphonic Terror – Live at Wacken 2017. KNAC.COM: You have a new live Blu-Ray/CD set Symphonic Terror – Live at Wacken 2017 coming out. This isn’t the typical live album though. HOFFMANN: That’s right, this was recorded last summer at Wacken with a symphony orchestra. I’ve always wanted to to this and this was a dream come true and it was in front of thousands of metal fans. KNAC.COM: As you know sometimes these kinds of things work, sometimes they don’t. We’ve seen SCORPIONS, METALLICA, KISS and DEEP PURPLE do it. Did you have any apprehensions as to how your music would translate in working with a symphony? HOFFMANN: Yes, but we had time to plan this out to ensure that we’d be doing it right. We didn’t have to change the arrangements too much. I think the mistake that some of the bands, in the examples that you mentioned, is that the arrangements are done so that the symphony plays the main riff of the song. We didn’t go in that direction, we rehearsed the set with keyboards in place of the symphony, which I believe helped us get the best arrangement possible. KNAC.COM: What was the length of time that you had to work out the new arrangements with the symphony? HOFFMANN: We had about a year to do it, so we had more than enough time to work things out and get it right. I’m so proud of this performance. KNAC.COM: How much 'sweetening' was done on this one? HOFFMANN: What you hear is what the audience heard on that one. We were very prepared and had worked things out. This is a live recording, as it should be. KNAC.COM: Since you came back, I’ve seen ACCEPT the two times you’ve performed in Portland, Oregon. The first time was in Peter’s Room which was a small space downstairs at The Roseland Theater. It was jam packed, it was a sweaty good time and it had the vibe of a punk rock show. Then you came back on the Stalingrad, tour which you co-headlined with KREATOR. That was upstairs in the big room at The Roseland. It wasn’t well attended, which was disappointing. ACCEPT hasn’t been back since. The American market is hard to crack, what’s your take on it? HOFFMANN: [long pause] I remember those shows, we were excited to play Portland and were booked to play the smaller club, then when we came back with KREATOR and were booked to play the larger room we were excited. There were nights on that tour where we filled the room and other times where we’d have what you saw in Portland. It was disheartening. America is like you said a hard market to crack and it makes it virtually impossible for bands to tour here. You can’t make any money and record sales? Well, you know that’s died down too. ACCEPT does great business in Europe, we’re playing major festivals and we headline our own shows to large audiences, so we concentrate on the European market. We’re scheduled to start a short run in America in a couple of days and we have no expectations of making money. We’re doing this for the fans that have supported us in the United States. KNAC.COM: Mark Tornillo has been in the band since 2009, which is longer than it seems. HOFFMANN: There’s a neat story behind how this whole thing began. I was visiting Peter Baltes in Philadelphia. We wanted to blow off a little steam so we went into a studio with a local drummer and played some old ACCEPT tunes. It was at that time that someone mentioned that there was a singer nearby that would probably be happy to join us for the day if we were interested. The guys said his name was Mark Tornillo and that he was very familiar with the classic stuff and that he was an incredible singer. Peter and I looked at each other and said, “Hey, why not?” Mark arrived and when he started to sing we knew we had something there. To be honest, before we heard Mark we had no intentions to ever get ACCEPT back together again. We didn’t know a guy like Mark existed. It was never our intention to get ACCEPT started up again. That’s how Mark got the gig. KNAC.COM: There was no intention to ‘re-launch’ ACCEPT? There was no actual audition for Mark? HOFFMANN: Nope, none. This was a jam and it just felt right and the next thing you know we got ACCEPT back together. KNAC.COM: I still remember hearing some of the clips from the jam that made it online. HOFFMANN: Well, they weren’t meant to be compared to the studio versions, we were just excited and wanted people to have a listen. I don’t know if that was the best thing to do. I know people on the internet expressed their displeasure about the sound quality, but again they weren’t meant to compete with the studio versions! KNAC.COM: Your producer Andy Sneap has spent a lot of time in The United States on tour with JUDAS PRIEST. Have you seen him with PRIEST? What did you think? HOFFMANN: We actually supported PRIEST this past July in Austria. It was a huge honor to open for PRIEST. I got a chance to see Andy’s performance and I think he did a great job stepping into the second guitarist role. He’s not trying to be Glenn [Tipton], he knows his role and didn’t overstep his boundaries. He was respectful to Glenn and PRIEST. I’m glad he’s gotten exposure in North America, he’s an incredible guitarist. KNAC.COM: Have you begun work on new material yet? When you’re ready to go into the studio do you foresee working with Andy Sneap again? HOFFMANN: We have some ideas that we are working on that will turn into songs, but nothing that more than that at this point. We will absolutely work with Andy Sneap again. We’ve been talking about it and he’s just as excited to work with us as we are to work with him. It’s going to happen. KNAC.COM: You think you could ever do a set without “Balls To The Wall” in it? HOFFMANN: That’s an interesting question. I think we could! We have enough classic material and material since Mark joined the band that we could. We could definitely do it in Europe, I would say that we could do that in America too. That’s interesting, I never thought of that.